Breaking news! Here's a new book out about my father, John Donnelley, who was the flight engineer on NC15376 and had a long career with Pan American from 1929-1969. The book includes discussion of the NC15376 crash along with period photos, many fun stories, the context of the time and much, much more! I'm using this directory to collect information about the crash of US NC 15376 (the Dominican Clipper"), Pan American flight 203, October 3, 1941. This flight started at Miami Florida at 07:33 EST and was destined for Buenos Aires, Argentina. It never arrived. 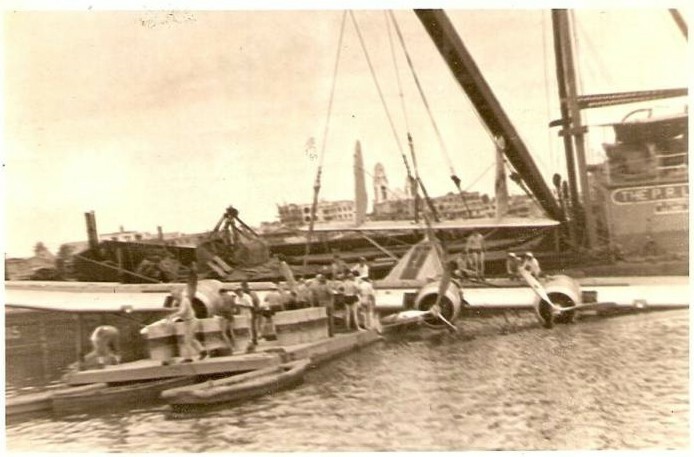 Instead it crashed on landing at it's stop in San Juan Harbor, Puerto Rico. I am interested in this flight because my father was the flight mechanic on the plane. At left is what my father looked like in 1942 shortly after the accident (from a US Coast Guard ID photo). At right is what he looked in 1958 when I began to know him at age 10 - with my brother and mother in a Christmas photo. I notice from my father's log book that he first flew NC15376 as co-pilot on May 26, 1936. He flew it and other S-42s and Consolidated Commodores many, many times between November of 1933 and at least October 1936 when the log book I have ends. Here his first log entry flying as co-pilot (second officer) on NC15376. There are many other samples from that log book along with other documents of the time in this directory: JDDonnelley. These came from the Richter Library at the University of Miami with the help of my cousin, John Hester. You can click on those images to get higher resolution scans - taken from 8 1/2 x 11 photo copies. To me those photographs help clarify the accident a bit. In particular one can see in the first ("port-early") the damage to the left wing tip (it's missing) that was done when that wing hit the water. That damage appears less to me in the photograph than it sounded from the CAB report. That was the side where young Fred Russo (below) was sitting, just under that wing. You can see why the water pressure there was so great. One thing that surprises me is that one can't see any evidence of the breaking of the hull in these photographs. 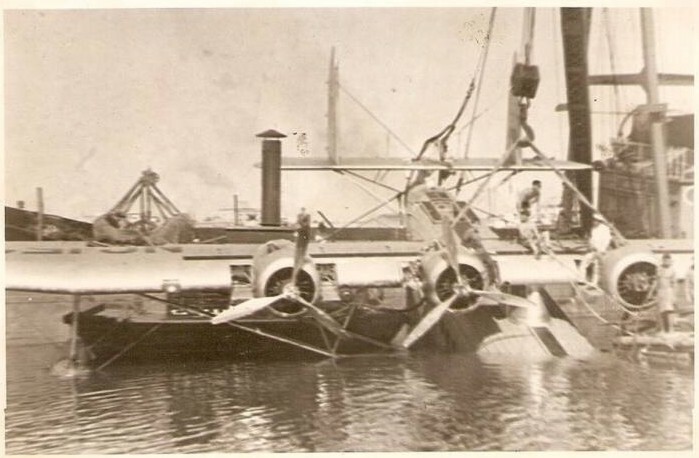 Perhaps that break was just enough to let water in, but not so much as to physically compromise the strength of the hull for lifting like they are doing in those photographs (?). I found it interesting that the plane sank in only 15 feet of water. The CAB report refers to the heroic efforts by Mr. Harold Roebuck (photo from his niece below right) Mary Roebuck, provided by his eldest grandson, Harold Roebuck, III), a native Puerto Rican (actually it seems Harold Roebuck Sr. was born in St. Croix in 1907), who "repeatedly dived and swam through the partially submerged cabin, freeing passengers and removing them from the wreckage. This action was attended by considerable hazard and physical discomfort as the surface of the water was covered by gasoline from the wreckage." (quote from the CAB report). The two youngest Russo girls, Suzie (14 months old) and Marie-Jo (24 months old), were killed in the accident. Mrs. Angelina Russo and her 3 year son Fred were in seat belts. Angelina was holding one of the younger girls and a steward was holding the other (according to the CAB report). The two young girls were thrown on impact and couldn't be found after that until their bodies were recovered. After the accident the CAB report indicates that Pan American set up a strap system to secure infants to those who are holding them during takeoffs and landings. That seems beyond what is done today. I know from my parents, and recalling engraved in my memories, as the plane was approaching landing I was looking out the window to see all the bright lights of San Juan. My two sisters, my Mother and I were on the left side of the plane and I was sitting by the window with my back to the pilot's cabin as the chairs were twins facing each other. My Mother, Angelina Seraphina Sibilia Russo, was on the aisle seat facing the pilot's cabin. 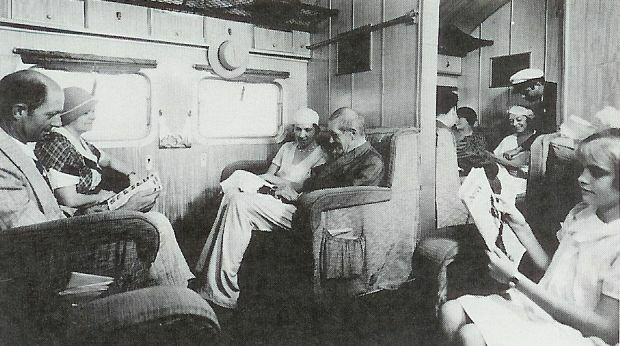 My Sister Marie Josee (2) facing my Mother and sitting next to me (in the arms of the steward according to the CAB report). My Baby Sister, Marie Suzie Russo (14 months) was laid on the seat in front of me (in her mother's arms according to the CAB report). Note that my 2 sisters, being small, did not have seat belts on. The seat belts and the heroic efforts of others such as Mr. Roebuck and Mr. Ritchie (see later note). As the plane was landing Marijoe got up and came to look out the window with me. As the plane hit the water the window blew up in my face and the glass went into my right eye arcade and, as per my parents, my eye ball was out of its socket (sorry to be so gruesome but these are small details that will help to understand what went wrong). On impact Marie-jo was projected into the pilot's cabin which at the time was opened and should have been closed during landing (no mention of this issue in the CAB report). I was in the water when someone carried me to my Mother Angelina who was bruised and hanging on the plane's wing in the sea. 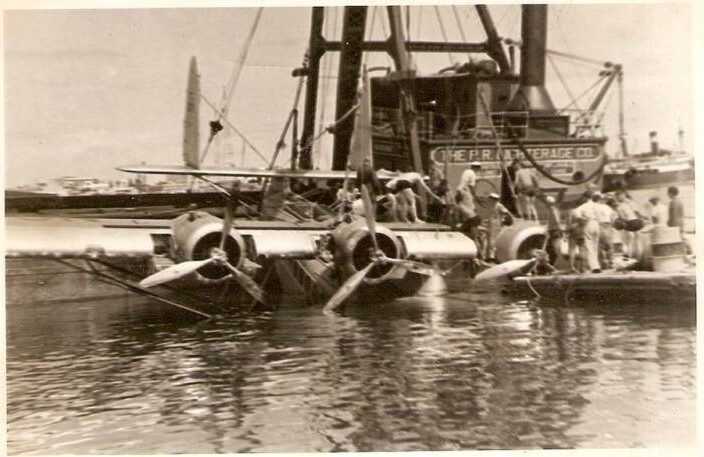 We were taken from the wing and placed in a Navy "Dingy" rubber boat. I remember I saw red, probably the blood running out of my eye, and I only had one white shoe and lost the other and of course cold and crying. Unfortunately the Navy due to security reason during the war send all ships out to sea at night and only had small boats for the rescue (according to the Boston newspaper article - below - the Coast Guard cutter Unalga "sped to the rescue"). The next morning my Father, with his Navy crew from the Naval Air Station, found Marie-jo in the pilot's cabin with severe head trauma and deceased. My younger sister Susie was found a few days latter floating in the bay of San Juan. Both were buried in Puerto Rico. A year latter when my Father was transferred and we were returning to Haiti "They" refused to give us back the bodies of the two girls. My Mother decided that she would not leave Puerto Rico unless "They" gave her back her two daughters. The Governor of Puerto Rico, then Mr. Munos Marin, and President Roosevelt did intervene and as per President's Roosevelt telegram "...Donnez pleine satisfaction a Madame Russo.." Then my 2 sisters were buried in Haiti in our family vault and now my Father Salvatore Russo Lt/USNRet (by the way his birthday is tomorrow February 3rd 2009. He would have been now 106 years old!) as well as my Mother have joined their daughters. Please note I am not sad any more telling this story. I have came to accept the facts of life as must we all. That compartment "D" was the area where Fred Russo, his mother, the steward, and Fred's two younger sisters where sitting at the time of the crash. You can see what the windows looked like, getting an idea for what it must have been like for young Fred to have one smash into his face as the aircraft twisted to a halt in the water. Here is a video clip that shows some S-40s and S-42s landing and berthed at the Pan American terminal at Dinner Key in Miami, Florida. It's an S-42 that is coming into land starting at 0:37 in that clip. In fact in that clip at 1:02 you can see the very Dominican Clipper, NC15376, that our father and the others were in when it crashed in San Juan, Puerto Rico. Lawrence Ritchie, wool company executive of Melrose, Mass., to Buenos Aires. Lawrence F. Keating, engineer, of Franklin, Mass., to Rio de Janeiro. Allen S. Hadley, Pan American executive, of East Orange, N.J., to Belem, Brazil. Clarence Hanson, Pan American mechanic, of Pekin, Ill., to Belem. 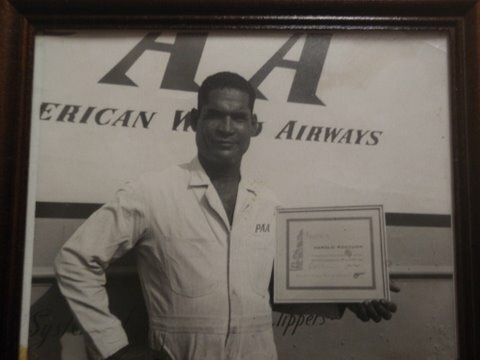 Arthur Hogan, electrician, of Baton Rough, La., to port of Spain, Trinidad. Thomas Thornton, machinsit, of Buncombe, Ill., to Port of Spain. 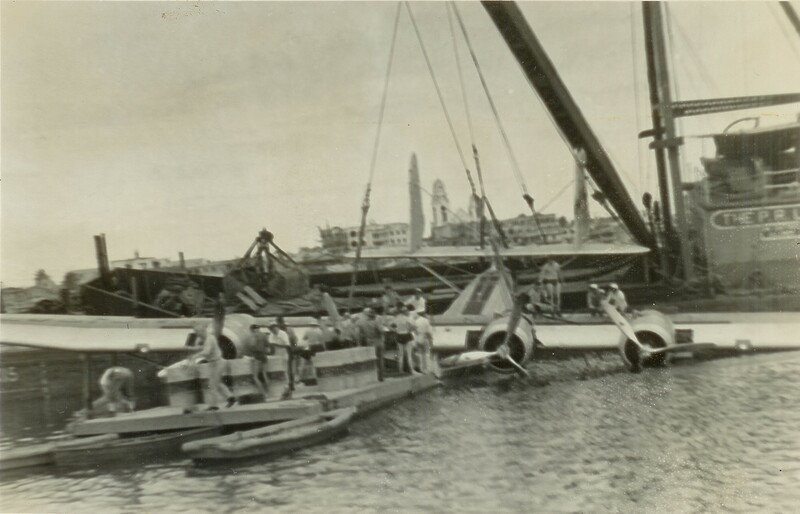 Marcus Helitizer, manufacturer, of New York City, to San Juan. Joan Herrick of Cedarhurst, Long Island New York, to San Juan. 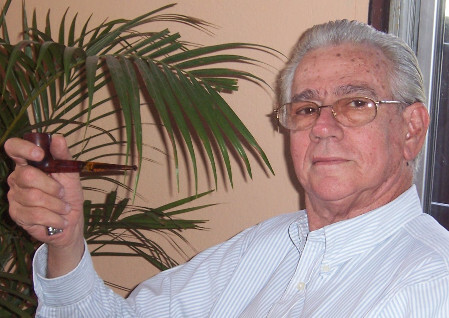 Robert Colon, engineer of San Juan. Rafael Bernabe, physician, of San Juan. Thomas Price, architect, of New York City, to San Juan on the way to St. Johns, Antigua. Arsenio Martinez, lawyer, of San Juan. Walter Bond, physician, of Philadelphia, to San Juan. Angel R. de Jesus, judge, of Charlottseville, Va., to San Juan. Rosa S. de Jesus, of Charlotsville, Va., to San Juan. Evelyn Baring, banker, of London England, to Buenos Aires. Marie Susie Russo (14 months). Those were all the 27 people onboard the NC15376 at the time of the accident in San Juan harbor. I find it interesting how much Pan American downplayed the injuries to the passengers during the crash. For example, I know that young Fred Russo had a serious head injury from the window that he was looking out shattering into his face. His eye was knocked out of it's socket. Fortunately his eye was saved (he later became a doctor), but he had some serious surgery and still bears the scars. The above article mentions the Coast Guard Cutter Unalga that "sped to the rescue." I haven't yet followed up on any connections with that ship. My husband had a cousin who survived a crash into San Juan Harbor on his way to Buenos Aires where he lived. His name was Lawrence Keating. He told us some time later (years) that he escaped holding on to several boxes of shoes that he was taking back to his wife who liked shoes made in the U.S. He let the shoes go to the bottom because there was a mother with twins in the water close to him and he took one of the children and consequently saved the child's life. This is one of the interesting stories that have emerged about our family history and I would love to connect it to the facts that you have provided. I've neglected to yet inform her that the newspaper from Mr. Ritchie does indeed confirm that Lawrence Keating was on that flight. I believe My father, Lawrence T. Ritchie was on board that flight (which seems to be confirmed by the newspaper article Robert Ritchie has). I am trying to accumulate information on it and confirm that this was in fact the flight. I believe he was picked up by a fishing boat, responding to the event. Also I remember an Award or certificate he had received from Pan Am. He was flying down to Argentina on a business trip. 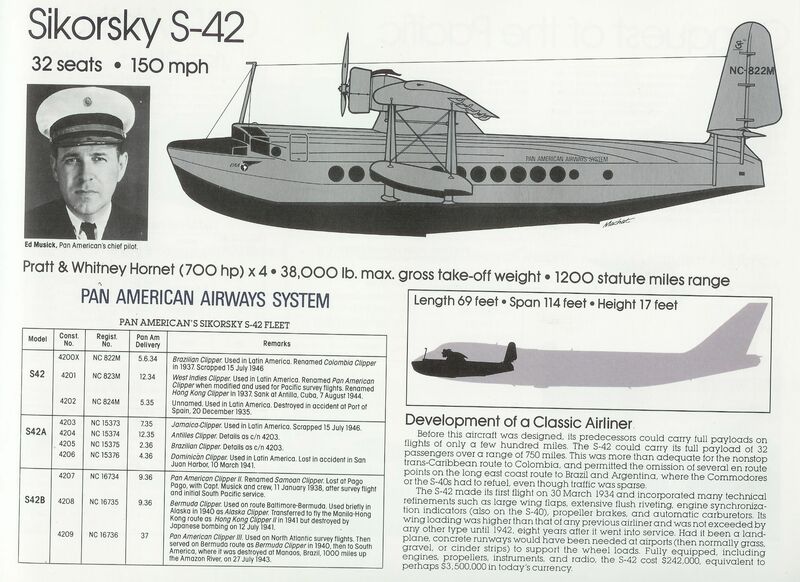 The plane he was on was a Flying Clipper (the Sikorsky S42 was the first aircraft given the "Clipper" name by Pan Am). It crashed in San Juan while attempting to land. A few people were killed and others injured. Dad's seat belt broke and he was thrown through an overhead hatch and landed in the water. His head was hurting and bleeding where he hit the hatch. When he realized what had happened he swam to the wing and pulled himself onto it. There was an injured person on the wing that he helped. I'm not sure man, woman or child. Something in the back of my brain says it was a child. The story that I recall was that there was a severe eye injury and that he held that person and applied pressure to keep the eye in place until help arrived. He continued on to Argentina some days later. I've also heard from others connected with this accident, but none with such startling connections - at least partly confirmed by records from the time. 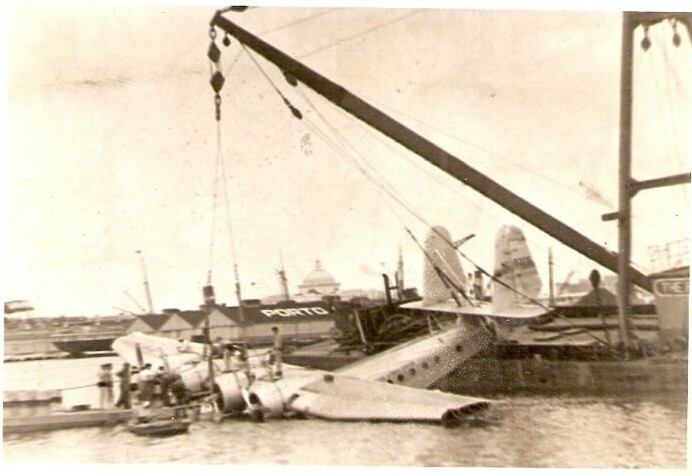 The CAB report concluded that the wreck was the fault of the pilot, Captain Charles A. Lorber. He was landing the plane with the nose too low and had turned off the engines too soon. This was compounded by a slight cross wind that was moving the plane to the left somewhat and the fact that he was landing downwind with a 3 Mph tail wind. Apparently sometimes the flight engineer is responsible for managing the engine speeds. The choice is up to the captain. 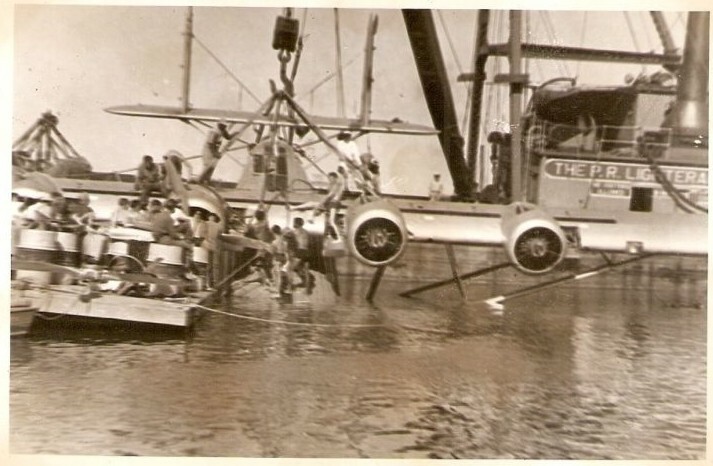 In this case captain Lorber was managing the engine speeds himself - fortunately for our father (or perhaps not ?, he might have been able to prevent the accident by running the engines longer). Our father felt that captain Lorber was incompetent (perhaps retaining too much of his old barn storming attitude?) and should have managed the landing safely by following standard procedures. Here is a page from "Pan Am, An Airline and its Aircraft", by R.E.G Davis that describes Pan AM's S-42 fleet. This page incorrectly lists the date that NC 15376 was lost as March 10, 1941. This mistake was apparently due to a misinterpretation of the European method of writing dates, taking 3/10/41 as March 10, 1941 instead of October 3, 1941 as was intended. Note: Some of these materials are subject to copyright restrictions from the Richter Library. The page from the R.E.G. Davis book are copyright by R.E.G. Davis and by Mike Machat. The eBay photos besides mine have unknown copyright. All these materials are placed here for the private use of myself and those who I am working with using these materials.